Madush preyed upon in Dubai ... by police tracking Amal! 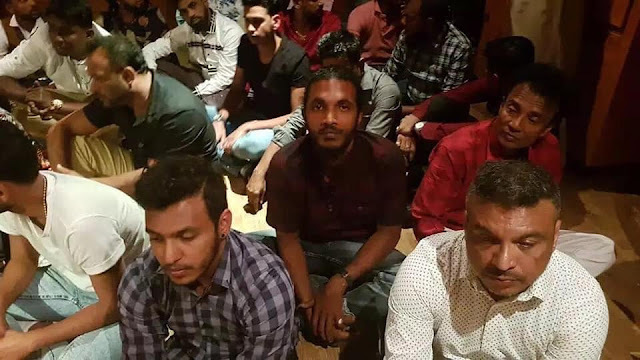 Fresh information reports keeps streaming in about the incident where underground kingpin Makandure Madush and 25 others were cordoned last morning at a six star hotel in Dubai. It was in 2015, 4 years before this that Makandure Madush has fled Sri Lanka. Though he was away from this country, nevertheless he has continued engaging in all types of underworld rackets and robberies in Sri Lanka by operating from Dubai and support from political aides was given to him. The influence exerted by Madush who comported himself in this manner in Sri Lanka during the past two three years in fact was massive. He even threw a challenge even to security people and carried on his activities in freedom. Nobody ever knew where he was in Dubai. Though most people had the desire to nab him, it was a difficult task to achieve. Though a bluth alert was sent out by international police with co-operation of Dubai Police, Makandure Madush managed to throw sand on the face of security forces and stay in hiding. Cornering him this way inside a hotel yesterday was a successful outcome of a plan laid by police for a considerable long period of time. Police in the meantime received information that the romance Makandure Madush is enjoying these days with wife of Kalu Thushara who was killed in the Welikada attack has a six year old son and to celebrate the son's birthday on a grand scale Madush has booked a six star hotel in Dubai. Police also received a clue that several persons from Sri Lanka have received invitations in this connection. Underground leaders of Keselwattha, Colombo are those who would give support to Madush even if their lives were at stake. This information incidentally was secured from a colleague in Keselwattha who recently was taken into custody in a heroin raid. Thus it was possible to gather information that close comrades of Madush had received invitations to attend this party and that Amal Perera on an invitation received by him for entertainment purposes at the party would be leaving to Dubai in the company of Nadeemal Perera and Ryan Van Royan (Lionel Sir). Information was received that among others who had received invitations to attend the function were some of those who appeared as singers on stage at Reality shows. Amal Perera was someone who was accused of a case connected with narcotics. His brother, Sohan Perera too was imprisoned a few years back on heroin charges. Amal of course became more popular because of an incident of selling a white turtle. Police on the other hand had received genuine information that he has connections with Madush. On these information, police struck out a strategy in a short time and that was to carry out a raid with connivance of Dubai Police. A feasible strategy was then launched whereby they were to check locations where Amal Perera and Ryan Van Royan were to go and then pursue them, which also seemed easy. According to information received, the operations team was able to direct police spies to pursue the artistes Amal Perera and Ryan Van Royan on their tracks. As arranged earlier the Dubai officers have met the Sri Lankan team there. Dubai Police was notified of the programme to carry out from the hotel where Amal was lodging and were prepared to inform of the time when Amal and the crowd were to start their journey. It was informed that the party concerned was to commence on the night of February 4th. Security personnel of that country was sounded across international police that a hall that could accommodate about 125 heads were booked at the hotel for this party and for that purpose it was a name of a brother of Madush which was used in that connection. It was the opinion of the Sri Lankan team that if the raid is to be launched, it would be important to hold back the raid till all guests arrive. Under this plan the crime unit of that country had been vigilant about this function and when the party was in swing on the night day before (4), the raid at hand was begun towards dawn of 5th. Strong security measures were taken outside the hotel and members of the raid had gained entrance by again locking up the doors. It was the advice of the Sri Lankan group that the suspects should be apprehended in that manner as they are those who carry out serious underground activities. Dubai Police who so gained entrance managed to capture 25 persons who were unarmed. The 25 suspects were thus directed to a room and were ordered to sit down on the floor, after which their information was secured one by one. It was revealed that at the moment of arrest, Makandure Madush and Kanchipana Imran have had false passports and false visas in their possession. By the time of this raid, over 20 grammes cocaine and a stock of heroin were found, it was reported. Madush has told that he had brought those along cocaine and heroin for his colleagues to enjoy. Enjoying cocaine according to laws of that country is an offence which warrants death sentence. As such, all of them have been subjected to being penalised as offenders apart from being suspects under warrant in Sri Lanka as well. Security personnel of that country are in the process of interrogating them by yesterday. The President has advised yesterday (5) for relevant parties to take proper action to get down these underground elements who are wanted for a number of crimes that have taken place in this country. It is also reported that discussions are underway to get these suspects on a diplomatic level. Future investigation procedures will be carried out under direct supervision and instructions of Senior Deputy Inspector General of Police, M.R. Latif, Commandant of Police Special Task Force and in charge of crime, organised crime and narcotics division.